Hello! Today I have a shaker card on the Hero Arts blog. 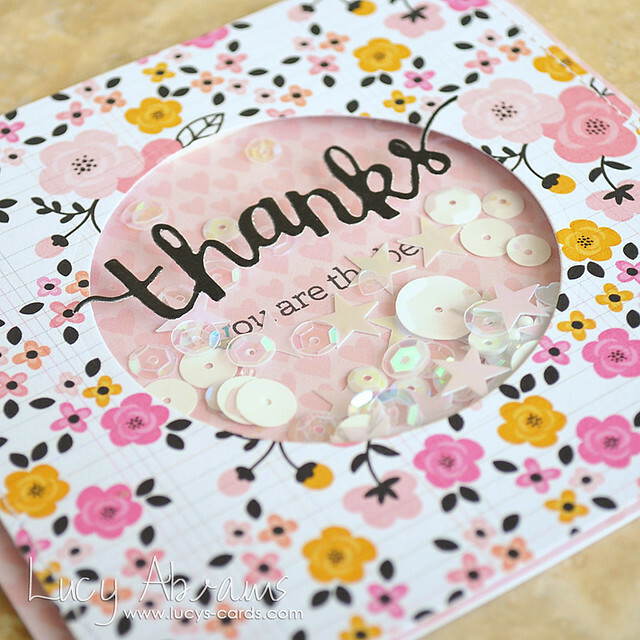 It features the very cool Thanks Stamp and Die set. I really adore these sets and have been using them a lot recently. They are so versatile… So for today's card, I mixed them with some heart paper from American Crafts' Serendipity paper pad, floral paper from Pink Paislee's Bella Rouge Pad, and some of my Lily White Shaker Selection. If you want to see full instructions for this card, head over HERE to Hero Arts. Have a great day, and bye for now. You must be the Empress of pattern paper because you sure know how to put them together. Love this shaker card. So happy I order your mixes.